When I saw Kaminomi II Episode 1-2, my whole body got weak! Yeah, Kusunoki Kasuga‘s arc! Amazing. She is a female Miyamoto Musashi. And she tries to suppress all the cute feelings in her since she sees it as weakness, which she has to overcome to be a “true” martial artist, a major obstacle to bushidou. And then her cute feeling becomes personified and becomes a loose soul. Yes, her loose soul is a personification/reification of her feminine side. Anything cute has a severe effect on her. 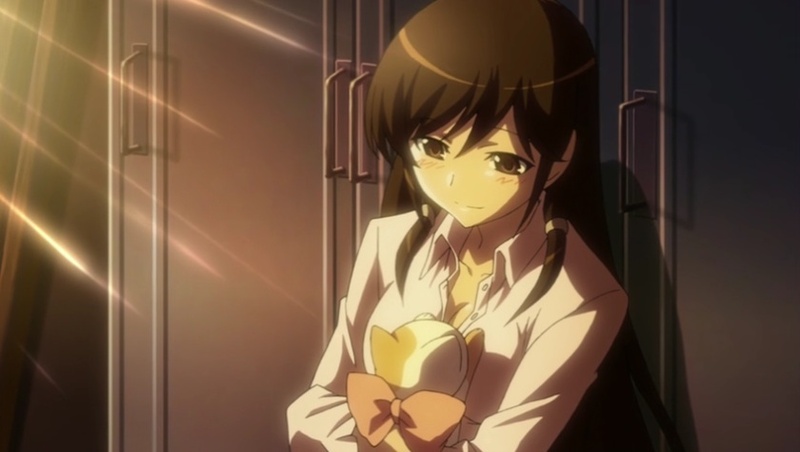 Yes, her whole body gets weak when she sees a cute cat at school, and yes, when Keima shows his pobrecito look on his face, a very soshokukei (meek) look! A tough girl is weak for cute stuff, OMG! My head explodes to stratosphere! Ah, how envious! I want to be this meek pussycat! Just like Kusunoki wants to be a “true” samurai, I’ve also tried to be a “true” otaku. But, I’m easily swayed by girl’s cuteness. Just a little eye contact with a girl would make my head go completely blank. I don’t usually go out since I’m a jitaku (my home) guy, well, more accurately a hikikomori, so I can usually manage to avoid that feeling. But once in a while, I have to go out to buy groceries, otherwise I will starve to death, and after shopping I sometimes stop by at Starbucks to get some decaf, and a barista over there is a cute Latin girl whose smile makes my whole body weak. Her smile is so cute that one time I almost dropped my wallet and made a mess with the coins shattered all over the floor, almost making completely a fool out of myself. So, I have to suppress it, since I should not feel attracted to 3-D girls. Just like Keima isn’t attracted to any 3-D girl, since he is an otaku fundamentalist, a radical two-dimensionalist, yes, God of Conquering that all dating sim gamers aim to be! This feeling causes intense suffering in me, especially when I see a girl already being taken, holding hands at shopping malls. So, every time I see 3-D girls, I avoid looking at them, just like Gautama Buddha told Ananda. And romantic rejections have severely damaged my body and soul. So, cuteness is associated with pain in 3-D that I had to avoid at all costs. So, I’d been struggling to suppress my weakness too. I even tried vegetarianism, but to no avail. I read that the Cathars advocated refraining from meat-eating would deactivate carnal desire. And Jesus said even just looking at 3-D girls with a thought of “she’s cute” is already committing a grave sin. So I tried, but failed. But at least I tried. But, this episode turned out to be a huge relief. Kusunoki finally accepts and embraces her feminine side. And at the same time, she embraces and kisses Keima. And then she is liberated from a loose soul, yes, BY A KISS, the ultimate skinship, the weakest act of all! Yes, cuteness/meekness is an invitation to skinship. That’s why it makes you weak. Yes, meek is cute. Anything small is cute. The Kasuga arc proves my point that meek is cute! One thing I didn’t understand was why womanhood was still associated with weakness in her. I thought feminism had changed that already. Actually, during the 90’s in Japan, soshokukei guys were called femio (feminine + otoko). But that term has become obsolete now since the word “feminine” is no longer associated with weakness. In fact, Kusunoki now decides to be both strong and feminine, thus dismantling machismo in her! She overcame her own machismo! Becoming a bushi meant becoming a man to her, but that’s been dismantled by Keima! Her jihad was an evolutionary process that eventually led her to evolve out of machismo with Keima’s divine help! Just like Kusunoki fell for a soshokukei guy, some girls should see my meekness as cuteness and conquer me and ultimately kiss me on my lips, so I will be liberated from a loose soul. So yes, skinship will save me. Skinship is my salvation! But no girl has asked me out…too bad 3-D girls are still sticking to machismo. They still think “I can’t have skinship with a wimp.” Too bad that they aren’t as evolved as Kusunoki. Thank you for the comment. Yeah, Kaminomi got great stories, probably my most favorite of this season! I think guts should do it. Why is weak considered beautiful? If you put it as a girl.. then that should be delicate is the term. But what a cool chick! Yes, “delicate” “sensitive,” yet Kusunoki called these “weak,” so I used that word to counter her prejudice, which was by the way already dismantled by Keima! As a martial artist, weak wasn’t beautiful to her, but now it is, so weak is beautiful! Yeah, she’s awesome!